Highway Code Rule 97; you should ensure that clothing and footwear do not prevent you using the controls in the correct manner. While most drivers wear safe and suitable driving footwear, some Taxi drivers choose to let it all hang out (that's your toes) by sporting a pair of Southend Beaches finest flip flops (other beaches are available), and although it is not deemed directly illegal to drive while wearing a toe thong, if caught up in an accident, you could find yourself being charged with driving without due care and attention. All clothing from head to ten toes (some people may have more or less) must be chosen with road safety in mind. Loose fitting footwear like flip flops can cause some major problems when trying to maintain complete control of your vehicle. You could find your flip flops slipping off or wedged beneath your pedals preventing you from braking correctly or in time to avoid a collision. If you are involved in a collision which the police feel could've been avoided if you were wearing more suitable footwear you could find yourself being charged, receiving fines of up to £5000 and 9 points added to your licence. 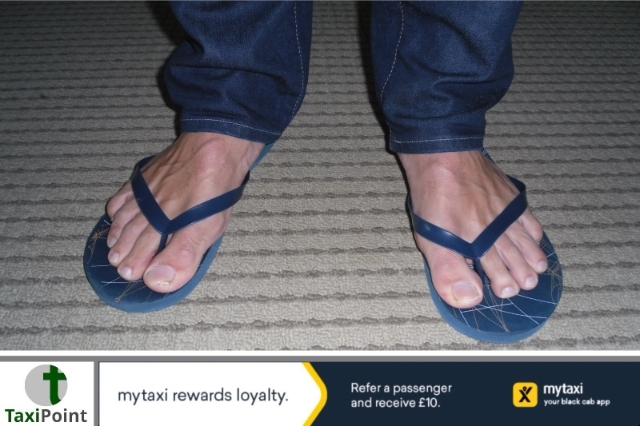 We all want to stay cool during the summer but it's best advised to consider more suitable footwear whilst driving around town, and let's face it , who's more likely to win a race to the toilets before they wet themselves - - the one wearing beach flip flops or the one wearing socks with sandals? Exactly.